A rich unscented moisture cream to soothe baby’s tender skin. 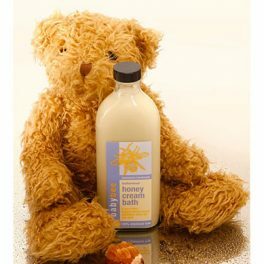 Honey and the herb oils included here have been used by generations to soothe baby skin conditions and general skin care. Many mothers have reported excellent results with infantile eczema. Indeed, a leading Hobart paediatrician recommends us to his clients! Every baby – to keep skin moisturised soft and healthy. A rich unscented moisture cream to soothe baby’s tender skin. 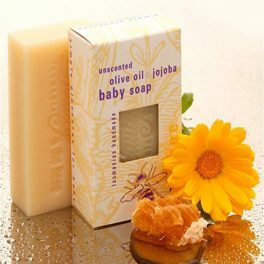 Honey and the herb oils included here have been used by generations to soothe baby skin conditions and general skin care. Many mothers have reported excellent results with infantile eczema. Indeed, a leading Hobart paediatrician recommends us to his clients, and the baby range is supplied in a Pamper pack to every baby born at the Hobart Private hospital. Guaranteed free from synthetics, chemicals and colours. For best results use sparingly after the bath on damp skin to seal in the moisture. Mount Wellington Spring water, leatherwood beeswax and honey certified (BFA), olive oil, cold-pressed almond oil, certified (OPA) sesame/castor/wheatgerm/coconut and carrot oils, Marigold flowers infused in certified (BFA) olive oil, Siam benzoin natural resin, Sodium Borate. Siam benzoin natural resinSodium Borate richly aromatic healing resin, antiseptic anti-fungal beneficial for dry skinnatural mineral salt, helps to emulsify oil and water together, antibacterial, antiseptic, used at 0.001 percent, trace amount. I love this product so much. I use twice daily for my baby cheeks and it works wonderfully. If I missed a day during dry season, his cheek would be red like tomato and I just need to apply a think layer and his cheeks will be back to normal. Both of my children have used this product since birth and they both have the most beautiful, soft, clear skin. The Honey & Herb baby cream is amazing. I highly recommend it. We are using it as our baby girl has eczema & in 2 days it is nearly gone and her skin is smooth as a babies bottom. Well worth the money. Thanks BeeBeauty. Wonderful product! has worked wonders on my toddlers eczema prone skin and have seen the results in just 2-3 days. Wish I had known of this amazing cream when he was a baby. Thanks for providing such a wonderful safe product. I feel good using this product on my baby and have never had a bad reaction to it. It’s creamy and absorbs right in leaving his skin soft and moisturized! My daughter always had rough dry skin. We tried many other organic creams and oils but Baby Bee’s cream still worked best for her. This is the only way I can keep her skin soft n suppple. Despite two courses of antibiotics and using cortisone cream my 4-month old son’s severe eczema had not improved until I started using Baby Bee bath cream and Honey and Herb baby cream. I was so relieved that I didn’t have to resort to giving him the prednisolone or use the trial cream Elidel. I have been using the baby cream for over a year now. It really is a fabulous product. I ran out recently and now my daughter’s Eczema has come back with a vengeance. This cream makes such a difference. I use alot of your other products and love them! My baby has been getting dry cheeks in this cooler weather and I used the honey and herb baby cream I was given in a gift pack when she was born. It is the only thing that works – almost instantly!! I am originally from Tassie and am very happy buying your products. I received this as part of a pamper pack when I had my little boy. I use the cream on my 2 1/5 year old little girl who has very dry skin on her hands. It is amazing it has helped to keep them moist and therefore she has no more broken skin and she does not scratch at all, she calls it her “special cream”.